Locally in Lynn, Chartwells serves meals to over 16,000 students in twenty-four schools; seventeen elementary schools, three middle schools, one alternative school and three high schools. Our goal is to provide the best quality food for each student one child at a time. The Lynn School Food Service Program is comprised of a partnership between Preferred Meals Systems and Chartwells. Over the past five years some of our accomplishments include: adding more Balanced Choice meals and "Better for you" snacks; adding more fresh fruits, vegetables and whole grains to our menus at all grade levels. Removing all fried foods from the menu and zero trans-fat in all foods. Look fore more exciting changes to come in the near future. During the 2010-11 school year a new state of the art computer system was installed in all school lunch rooms and cafeterias. This new system will track student lunch account history and balances. We will be implementing a new online pre-payment system that Parents will be able to monitor their child's account from home. Purchase meals, look at purchase history, set up low balance e-mail reminders and many more features. Nourishing students is not only our business; it's our commitment to the communities in which we serve. Chartwells is a diverse family of dedicated food and nutrition specialists serving the academic community. We deliver customized solutions that benefit our partners through innovative programs. We are pleased to inform you that Lynn Public Schools will be implementing the Community Eligibility Provision (CEP) while participating in the National School Lunch and School Breakfast Programs for School Year 2018-2019. What does this mean for you and your children who attend any Lynn Public School? Great news! All enrolled students are eligible to receive a healthy breakfast and lunch at no charge to your household each day of the 2018-19 school year. Your child (ren) will be able to participate in these meal programs without having to pay a fee or submit a meal application. This means each student is eligible for ONE complete breakfast meal and ONE complete lunch meal at NO CHARGE. If your child wants to purchase a second entrée, a juice, milk or other ala carte items they will need to have money on their account or pay with cash. There will be no charging on accounts allowed for these items going forward. We will be issuing a separate memo in the future, concerning refund requests for any positive funds in your child(ren) account. Please keep in mind, these funds can still be used for purchasing ala carte items at the schools. Estamos contentos de informales que las Escuelas Públicas de Lynn estarán implementando la Provisión de Elegibilidad de la Comunidad (“Community Eligibility Provision – CEP”) mientras participando en el Programa Nacional de Almuerzo y Desayuno para el Año Escolar 2018-2019. ¿Qué significa esto para usted y para sus hijos que asisten a cualquier Escuela Pública de Lynn? ¡Muy buenas noticias! Todos los estudiantes inscritos son elegibles para recibir un desayuno y almuerzo gratis cada día para el año escolar 2018-19. Su(s) hijo(s) podrá participar en estos programas sin tener que pagar o proveer una aplicación. Esto significa que cada estudiante es elegible para UN desayuno completo y UN almuerzo completo GRATIS. Si su hijo quiere comprar un segundo plato de comida, jugo, leche, u otro alimento adicional, necesitará dinero en su cuenta o tendrá que pagar en efectivo. No se permitirá poner cargos en cuentas sin fondos en el futuro. Se proveerá otro memorándum en el futuro sobre las solicitudes para el reembolso de cualquier fondo positivo en la cuenta de su(s) hijo(s). Tenga en cuenta que estos fondos aún se pueden usar para comprar alimentos en las escuelas. Our Summer Meals program for 2018 has ended. Please check back here in late Spring 2019 for next year's program details. Click on the Chartwells logo for the current menus for all schools. 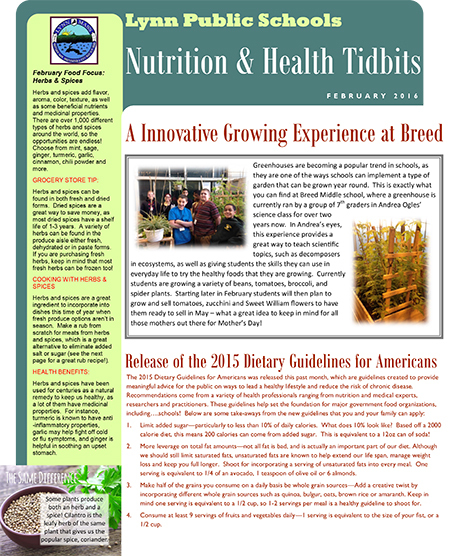 Our Monthly Newsletter - "Nutrition & Health Tidbits"
Download our monthly newsletter for local school and national nutritional and health news! Feeding our students high quality meals that are nutritious and delicious is our top priority. Menus are built to support the Dietary Guidelines for Americans and use recipes that taste great and are lower in fat, saturated fat, trans fats, cholesterol and sodium and provide whole grains, fruits, vegetables and appropriate portion sizes for age. Click on the Chartwells logo for Lynn Public Schools nutrition information. Starting in school year 2018-19, Lynn Public Schools is implementing the Community Eligibility Provision (CEP). With this provision, each student enrolled in a Lynn District school is eligible for ONE complete breakfast and lunch daily at NO COST. Anything above and beyond a complete meal (second meal, second milk etc) will need to be paid for with cash or money on account. There will be ZERO charging allowed. Please keep in mind that a milk by itself is not allowed in the CEP provision and will also need to be paid for. Click on the Chartwells logo for additional information. Students have the opportunity to pre-pay for the second meals and ala carte items they purchase from our cafeterias. Click on the Chartwells logo for additional payment information and prepayment sign up.